JoAnn Adams began knitting when she was seven years old. She spent many hours beside her grandmother learning to knit, purl, and follow a pattern. Years later, a dream came true for her when she purchased a small flock of sheep and began spinning and knitting their wool into beautiful garments for the family and for sale. The family farm in Pleasureville, Kentucky is home to Sam, JoAnn, and Samuel Adams along with their flock of natural colored long wool sheep. Sam and Samuel shepherd the flock year round, from lambing in springtime to shearing in the fall. JoAnn, also a middle school teacher, spends her summers and evenings carding, spinning, and knitting the lovely natural colored wool. Fleece, yarn, sweaters, and spinning wheels filled every corner of the Adams' farm house. Sam and Samuel good naturedly tolerated the fleece in the bathtub and yarn in the kitchen sink. Sam promised JoAnn that one day she would have her own studio. That promise came true when Sam and JoAnn acquired the original timbers of the Low Dutch "Six Mile" Meetinghouse. Nearly two years later, The Meetinghouse opened as home to JoAnn's fiber business "Sweet Home Spun." The Meetinghouse is once again a gathering place for the community. 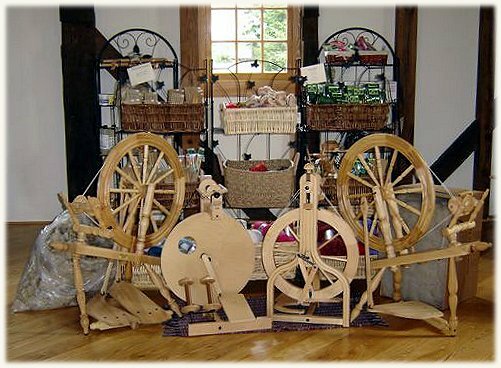 Knitters, spinners, and fiber lovers meet to spin, knit, take a lesson and shop for the perfect yarn or spinning wheel. Other local artists and fiber producers also sell and demonstrate their craft in The Meetinghouse. 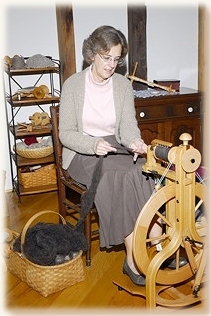 Visitors can find JoAnn spinning yarn, knitting a sweater or washing a fleece most any evening or week-end. The sheep also welcome visitors to the barn. JoAnn offers lessons for individuals and groups. Call or e-mail to schedule a class. This site was created by Joyce K. Meyer, on October 8, 2008. Logo art work by Susan Coleman, Logo Photograph by Joyce Meyer, Logo Graphic Composite by Joyce Meyer.